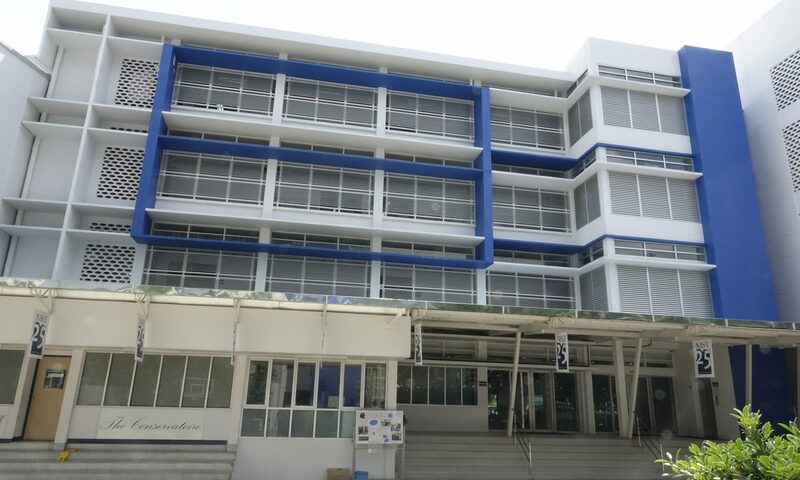 While visiting Bangkok Thailand in October I took a trip down memory lane to My Old School — The International School of Bangkok. 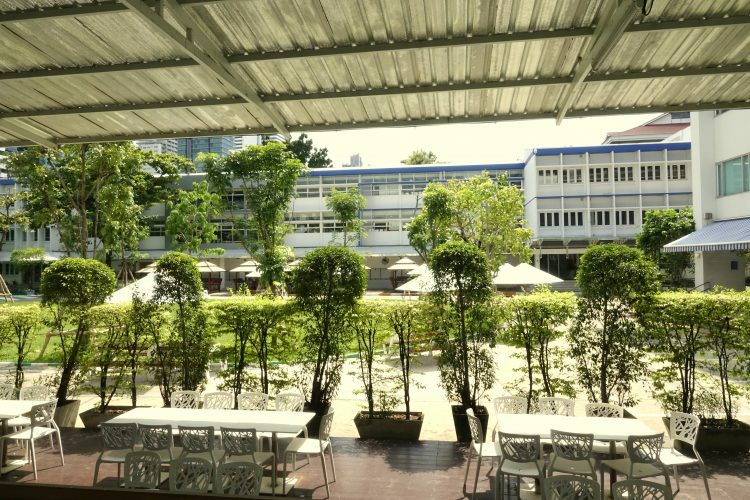 When I went to this school for my high school years — 1965 to 1968, it was located on Soi Ruam Chai, number 15 Sukhumvit. 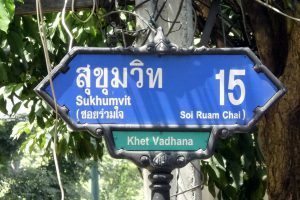 Sukhumvit is the name of a major thoroughfare that originates in central Bangkok and then run east and south over 60 kilometers. 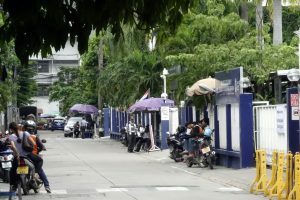 The sois, or lanes that run perpendicular from Sukhumvit to the left and right have names but they are also numbered, with odd numbers on the outbound side (motorists drive on the left in Thailand) and even numbers on the inbound side. Long ago the school moved out of town, to a new campus in Nonthaburi, Thailand, about 30 kilometers to the north. 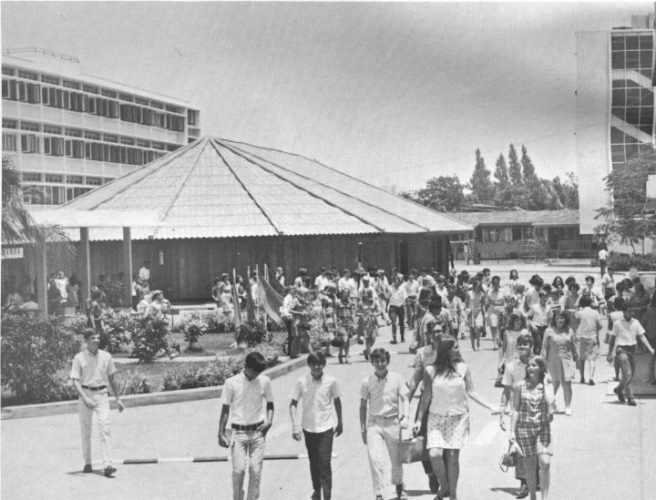 I wanted to see the old ISB campus which was taken over by the New International School of Thailand (NIST), now celebrating its 25th anniversary. I set out on foot from my hotel on Soi 18, which is about a half-hour walk from the school, but I took a leisurely hour, soaking up the memories from the top of the soi on down. As I was on the inbound side of Sukhumvit I had to cross over to the other side. This used to be a matter of simply taking your life in your hands and negotiating the traffic rushing in both directions. Not anymore. Since my day an overhead light rail network called the Bangkok Transit System was constructed, and the BTS Sukhumvit line was built right down the center of what is now a divided Sukhumvit. 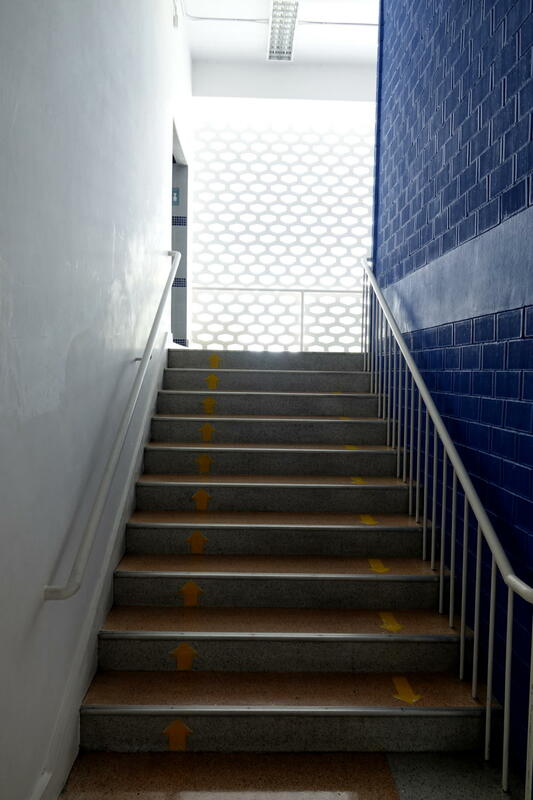 To cross over one uses a pedestrian overpass found every other block or so, or where the BTS stations are. I crossed over at Soi Asok, Sukhumvit soi 21 on the outbound side, over from soi 16 on the inbound side, through the Asok BTS station there. I then walked west, toward downtown looking for my memory lane. I would never have recognized it without this sign. 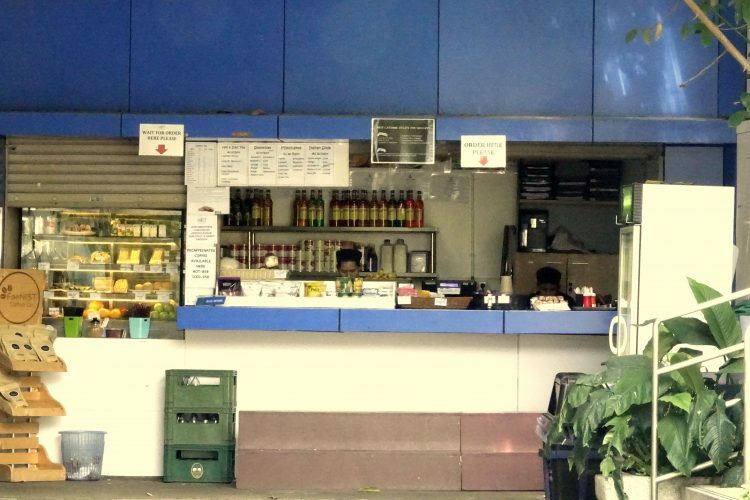 Under the sign, at the Sukhumvit end of the soi 15 Ruam Chai there was a noodle soup shop where I would often come after school to snack on khow phat or “ha baht” soup — great food for about 25 cents back then . There is a noodle soup shop there now, though who knows if it is still in the family. I remember it bigger than it is now. 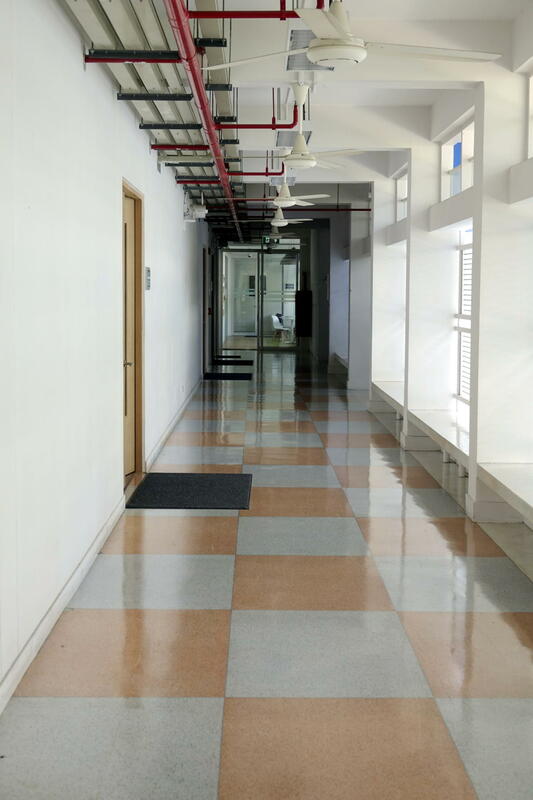 I turned down soi 15 toward the spot where my old school once stood, about a kilometer away. I remember the soi was always busy, and it still is. But I also remember it to be a bit wider and a lot less “tall” than it is now. Unlike today, back then vehicles coming and going passed each other with relative ease. Not anymore. 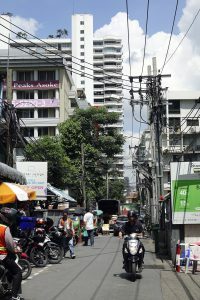 And now high rises line both side of the soi. The incredible amount of high rise construction over the years explains both the narrowing and the “tallness”. 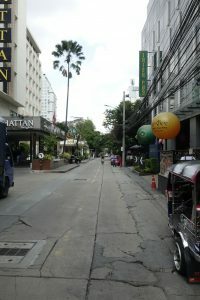 Not far from the top of the soi stands the Manhattan Hotel on the left, as it has for at least fifty years. There is now an apron in front where vehicles can pull up to the door. Another indication that the soi used to be wider. Walking down the soi I reminisced about the food vendors that sold grilled chestnuts, plantains, skewered chicken and pork, and iced Thai coffee from their carts, pushing them up and down the street. 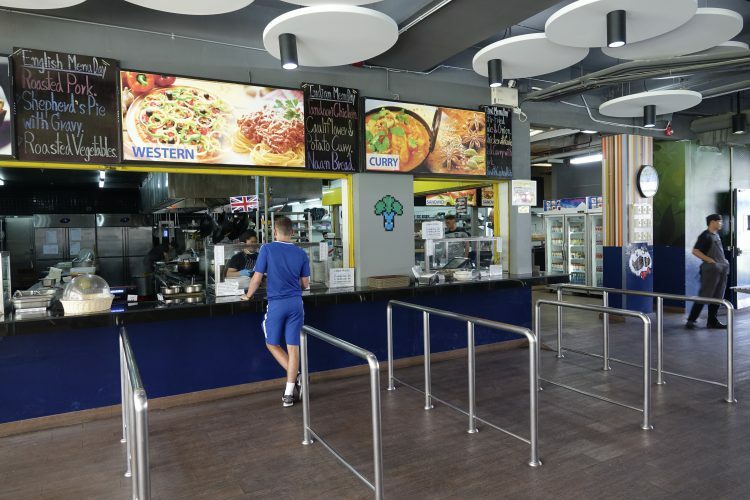 There is still street food to be found along this memory lane, but the vendors are stationary, arrayed with the hibachi’s below large umbrellas and tarps held up with poles. Gone are the carts. 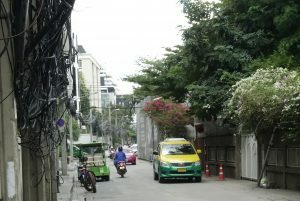 All up and down soi 15, the electrical wires hang all over themselves, as they do all over Bangkok. They cluster like nerve ganglia on the utility poles and drape down low sometimes, way low, between the poles. These are images not in my memory. I was told by a local that the city has started to put these lines underground, but not on this street. I approached the guards at the gate and asked if I could take some photographs. They said no. 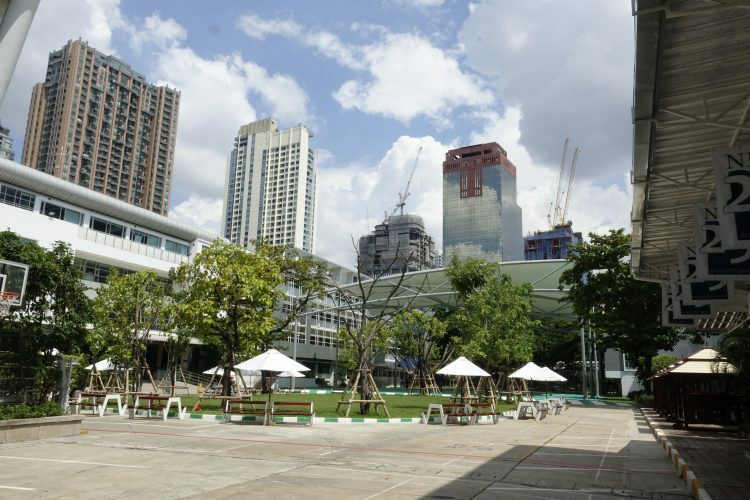 So I explained as best I could with my meager command of the Thai language, that I had lived in Bangkok 50 years ago and this is where I went to school. 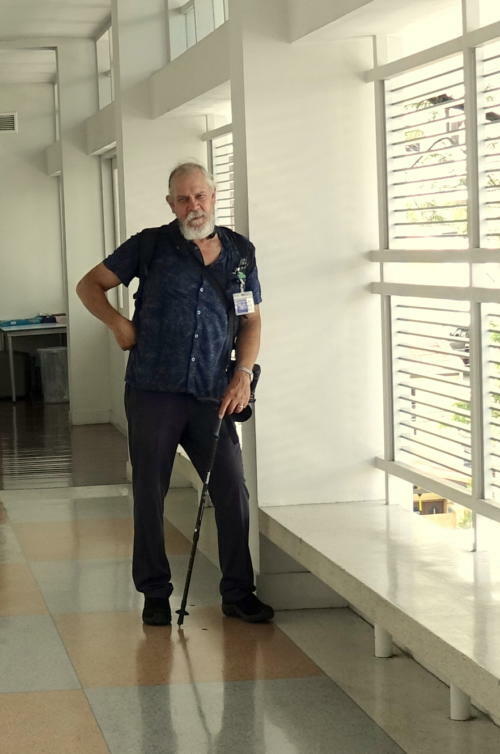 The guards hesitated, but then an administrator walked by and with my explanation escorted me to the administrative offices. Back in the day there was a wider gate. Bigger buses of varying sizes and shapes plus an array of passenger cars passed through them. 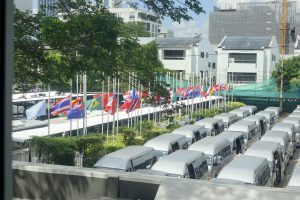 Students of NIST are now transported by a fleet of small buses seen here, all lined up in a row. You can also see flags of the nationalities in attendance at NIST, at half mast in honor of the passing of the king. In my day while many nationalities were represented, about 90% of the students were Americans, many of them sons and daughters of military officers and staff engaged in the Viet Nam War. 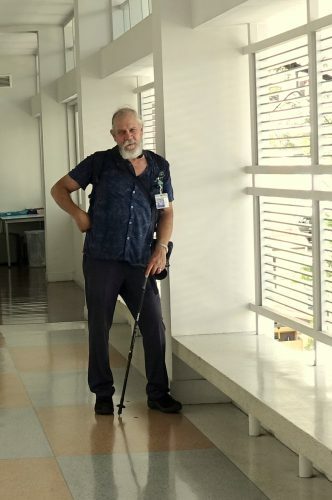 I presented myself to the receptionist in the administration building and explained my history and that I would greatly appreciate an opportunity to look around and take some photographs. 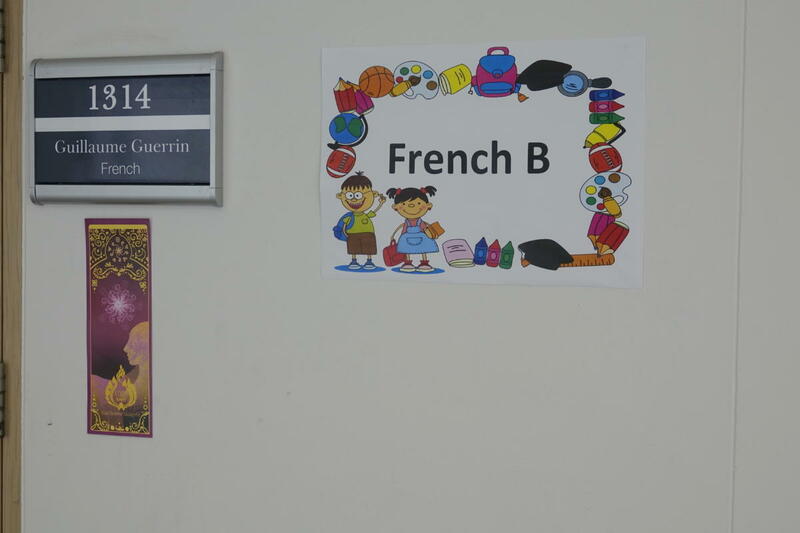 The receptionist arrange for me to receive a guided tour, led by Ms. Nandini (“Mini”) Pavaphiphat, who is the school’s Administrative Assistant and Alumni Manager. 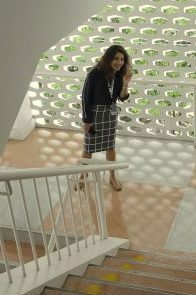 She escorted me all around the campus and up and down the stairs of what was the ISB high school building. Today the old ISB high school is the NIST language center — 15 languages are taught. Where the old library was, there is now a conservatory. I remember well the main steps with the library on the left. 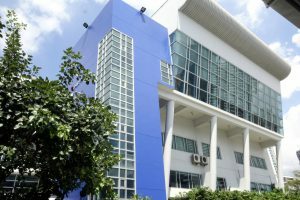 The building, once all white, now has blue trim. 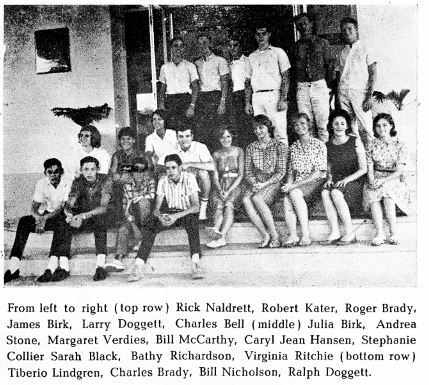 The featured photo at the top of this blog post shows the high school building as it is today. 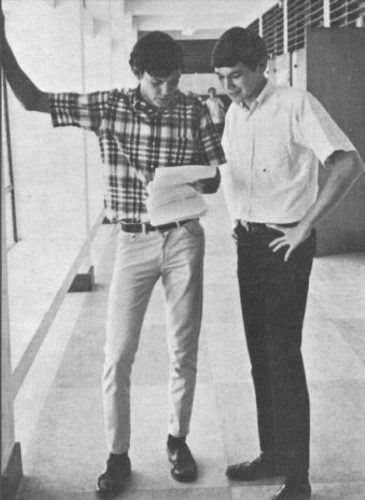 The photo below, from the 1968 Erawan yearbook, shows the building as it was in 1968. Looking across from those steps one used to see the big gym that served not just for sports but also for assembles. The gym held the entire high school student body for those special events. In my last year there (1968) we had a mock political convention, mimicking the US Republican Party convention to be held in Miami later that year. The gym was razed long ago, replaced with what is now the stylish creative arts building. 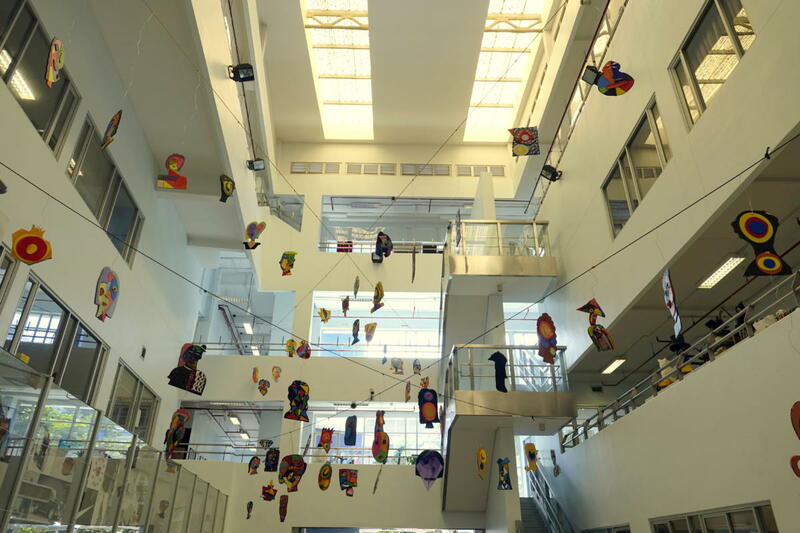 The building has art class rooms, a shop class room, a culinary arts room and a lovely three story high atrium. From between the old high school and the creative arts building looking inward, one sees the wide open space where the “sala” once stood. 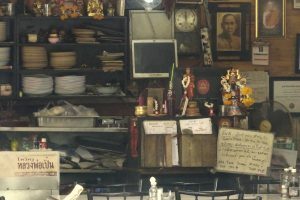 A Thai sala is a pavilion open on all sides. The ISB sala was a wonderful open air multipurpose area where we had art classes and a variety of group activities, including school dances. We also ate our brown bag lunches and snacks that we bought at the canteen there. Tom Wilks, Willis Bird, Charlie Hodgkins, Arnold Griffin. The old ISB/NIST campus is encircled by high rise buildings, none of which was there in my day. 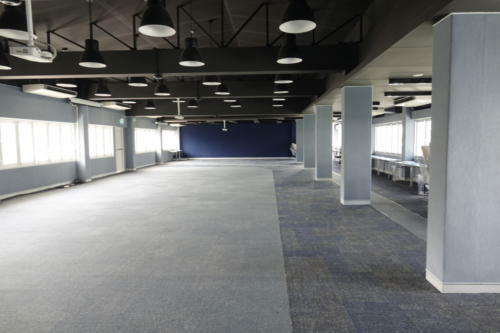 The space where the sala was is now open space. On the far side of this are some basketball courts and beyond that the elementary school playground. The closer building on the left was built after ISB moved out. 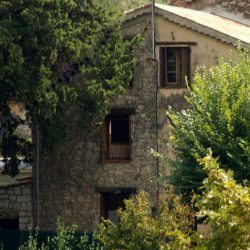 The one next to it further along was there in my day as can be seen in the photo of the sala. 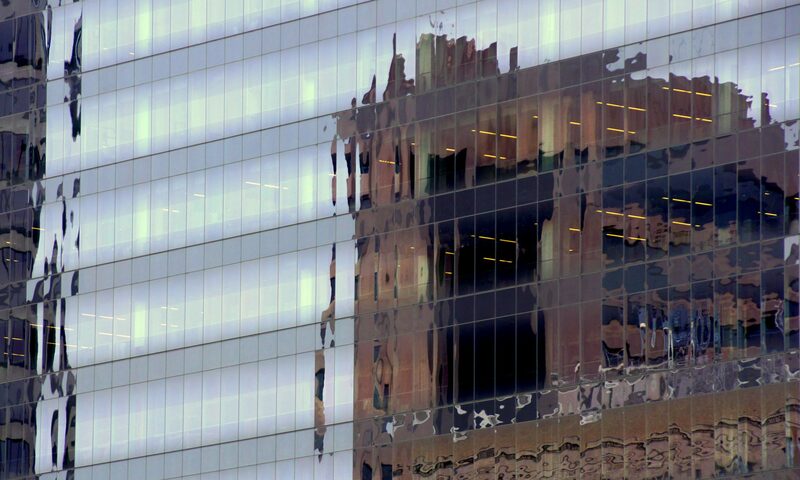 I remember visiting that building for college guidance counselling. 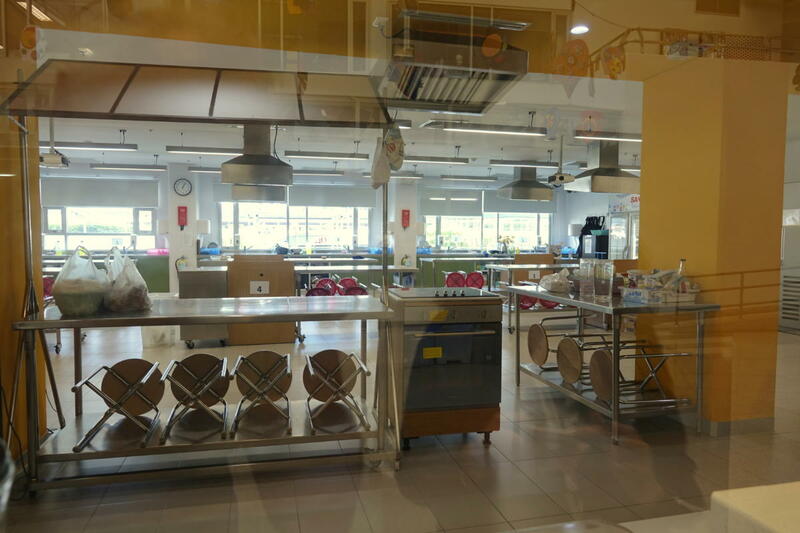 The exterior of the old canteen is little changed. The same window in the wall through which we bought milk, juice, sandwiches and sweets is still there, though the interior is much changed. In those days we bought chits to pay for food items. The eating facilities are much changed at NIST. 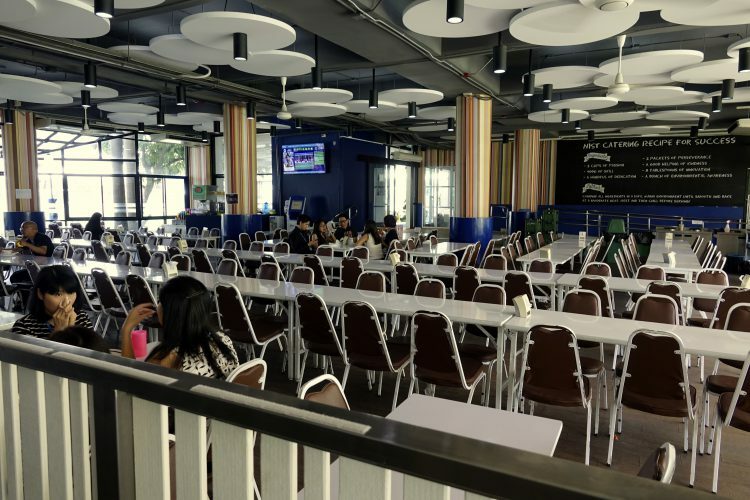 They have a walk-up cafeteria next to a dining hall, as well as seating outside. This is all in the building next to the old guidance counselling offices, in a space that was part of the open playing field. 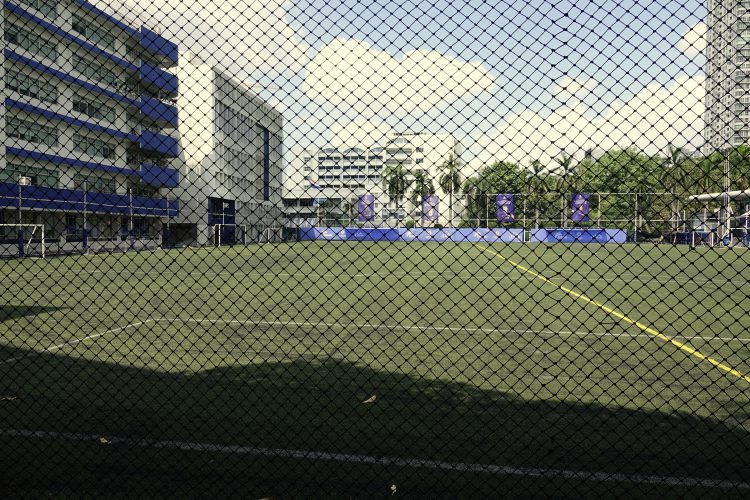 The playing field is still there, stretching back to the old klong (canal) that is just over the far fence with the blue covering, but it is much truncated, since in addition to the dining facility, the NIST high school building is on the left hand side of the field. 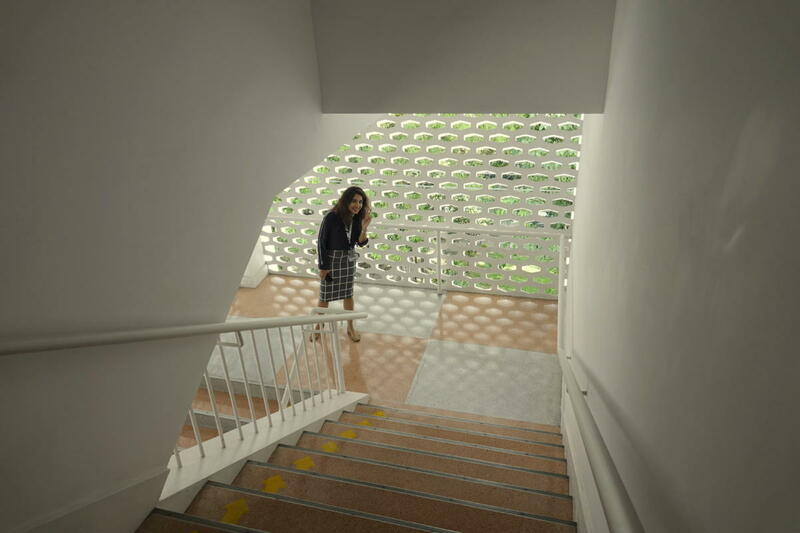 Toward the end of the tour Mini allowed me to visit inside what was the ISB high school building. For me this was the highlight of my visit as it brought back so many wonderful memories, especially since many of the hallways and stairways look much as they did in my day. Note in particular the unchanged floor tiles in the two photos on the right, one showing me during this 2017 visit and the other showing me and my student government colleague Reid Copeland in 1968 (Photo credit 1968 Erawan). An extended slide show of photos taken on this delightful trip down memory lane to My Old School is given below. Click on any image to enlarge the image and begin a slide show with clicks on the buttons at the bottom center of the image. 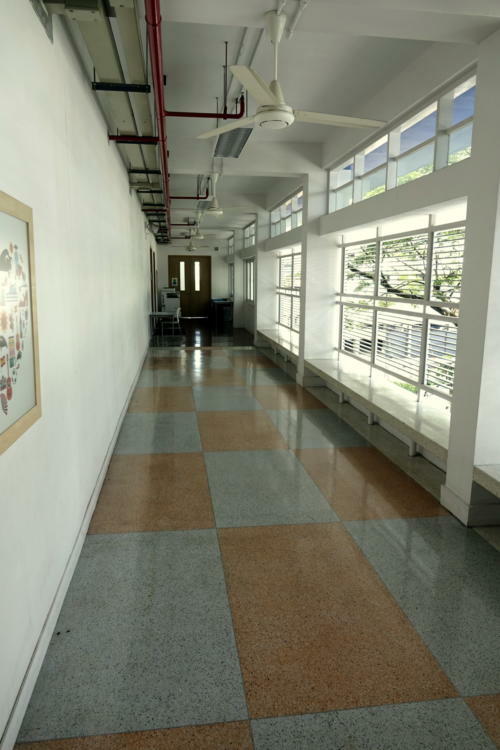 Again a very special thank you to Ms. Nandini (“Mini”) Pavaphiphat, the NIST Administrative Assistant and Alumni Manager, who graciously showed me around her wonderful school and my memories.